When I started raising goats in 2002, most people didn’t know much about the copper needs of goats. Veterinarians, goat breeders, and pet owners alike thought that if you simply provided a free-choice, loose mineral, your goats would get all the copper they needed. But I learned the hard way that that simply was not true. For the first five years, we had does not getting pregnant or staying pregnant. When they did give birth, they would usually have only one or two kids. All of my bucks died before they were three years old. And vets could not tell me why my goats were having so many problems. Ultimately we learned that it was copper deficiency. Because it wasn’t a recognized problem in goats back then, I had to buy cattle copper boluses, break apart the giant capsules and size them correctly for goats. 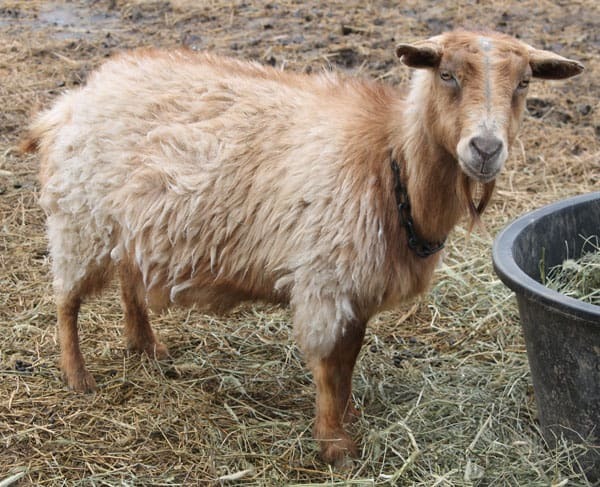 Although copper oxide wire particles have been studied extensively to keep internal parasites at bay, there has been very little research done on copper supplementation in goats. For years I’ve been saying that someone should study this! And then it occurred to me that I could be that person. I have a master’s degree, and since I suffered through classes in both quantitative and qualitative research, I should put that knowledge to use. So I developed a survey that collects information on goat owners’ practices, environmental factors, diet, and incidence of copper deficiency and toxicity. Click here to take part in the survey. Regardless of whether or not you’ve had a problem with copper in your herd, your answers are important. The results will be shared right here on the blog next month. You can sign up for our newsletter (box on the right side of the screen) to be sure that you don’t miss it. Please share this post with fellow goat-breeding friends and on social media. The more responses we get, the more relevant the results will be and the more we will all learn. Thank you! I wish there was an easier way than bolusing. When you have two hundred goats. Hi Nina – I have a water issue with my goats – my water is very hard, and has a large amount of iron, manganese and calcium in it. I am working with a vet, but it is inhibiting calcium absorption..making the phosophorus to calcium 2 to 1 when the blood is analyzed. I have copper bloused 2x per year to the dams, but have had no decrease in the bowing out of the kids front legs at about 2 months old (all were born with straight fine legs and the bowing out occurs with only some of the kids.) Where do you get the multimin injections from and are you familiar with too much phosphorus to calcium? MultiMin is by prescription, so you have to get it from a vet. Contrary to Nina’s experience, I quit using MultiMin because I had a buck die of copper deficiency three months after an injection. The liver level of copper was only 14 ppm when it should have been 25-150 ppm. We have a lot of sulfur and iron in our well water, and the copper oxide wire particles work great for us, but we have to use them every 3-4 months. We have done liver tests, and that keeps the copper in the mid-normal range. Iron , we have it too and we installed a water system for the house that also supplies the barn. Copper Bolus mine twice a year. I been having to Bolus about twice a year to combat coat and skin problems. We do have iron in our well water. I was told that interferes with absorption of copper. When I first got goats a vet told me there should be enough copper and minerals in their goat feed. After problems with coats I started Bolus. You can watch their coat and skin improve. Copper deficiency is only one mineral that reflects, poor coat. Should also consider, Boron ,magnesium, selenium, DHEA, Amino Acids, and Acia supplements. Copper is the cure. For Georgia Goats anyhow. I’ve also been adding oregano in their feed . No more wormy goats. That’s really cool! Are you regularly doing decals to confirm this? Are you milking goats who get added oregano? Does it affect the flavor of their milk? I give mine copper bolus twice a year. Also give selenium injections twice a year. We live in Florida and have a shortage of both in our soil. Also, we have high iron in our water, but soften it and use iron out. It really helps. We copper bolus the herd once a year. But we have a couple of goats who require it 2xs a year. We have noticed they tend to have darker colored fur than the others. We also give a shot of BoSe 1 to 2 weeks prior to the bolus. It seems to help the copper get on board easier. 5 years ago I had a red haired goat who had horrific skin scaling and always looked uncomfortable. She also developed the classic spectacle rings around her eyes that indicated a copper deficiency. Unfortunately, She had a sever case and we had to put her down. Ever since then I have been copper bolusing. (after much research and learning the significance of the problem). I boluse them 3 times a year and give Bose twice a year. I also give zinc sublingual supplements twice a year and A&D Shot twice a year. My herds health is great. Thriftyhomesteader, I just took the survey and forgot to leave a name or an e-mail, but would be happy to be contacted if it helps. I was the one who commented that she has been using the cattle dose in her goat herd instead of the goat dosage since 2004. With only success. My contact info is 417-349-2217, or Emily OzarkJewels Dixon on FB. I rarely check my e-mail. Thanks for helping to spread the copper news in the goat world!